Welcome to the sixth installment of my blog series that I’m calling Story & Song. Each post will feature two pieces of music: a modern/contemporary song from the playlist of The Violinist of Venice, and a piece of Vivaldi’s music that features in the novel. I’ll describe how both pieces fit into the story with a minimum of spoilers! This lovely ballad goes with Chapter 68, which I also titled “Forgiven”. It is hard to say too much without giving some of the story away for those of you who haven’t read the novel, but in this scene, Adriana and Vivaldi are meeting again years after the “main events” of the first half of the novel, and Adriana realizes that she no longer bears him a grudge for the wrongs that he did her so long ago. The lyrics of this song fit so perfectly with her thoughts, with their situation, with the history of their relationship. I would always listen to it when revising this scene! This is the aria performed by Anna Giro in her role as Alcina in Vivaldi’s opera Orlando furioso, in Chapter 67 of the novel. As Anna Giro truly did originate this role, Vivaldi wrote this aria especially for her and for her voice. As you can no doubt hear, it is beautiful and wistful and full of longing. The lyrics of the A section translate roughly to, “If only I could also have with the one I love the peace that my heart cannot find.” In the novel, as Anna sings these words, Adriana reflects on them in relation to her own life. I have performed this aria several times myself, and I just love singing it. It is fun to sing from a technical aspect, and fits my voice well; it’s also fun from the performance aspect for the emotion I can inject into it. I wanted to learn it because I knew I would need to write a scene such as the one in Chapter 67, and this seemed like the perfect aria. I also loved the feeling of connection that learning and singing this piece gave me to the characters in my novel. When I sang it, I could pretend, for a moment, that I was a part of the story I was writing. 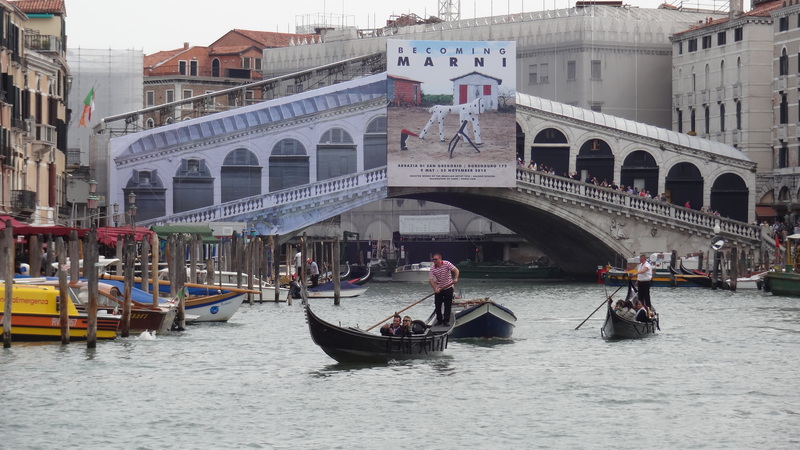 In my An Ode to Venice series, I’ll be posting pictures and information about my favorite places in Venice, including those that figure into The Violinist of Venice. 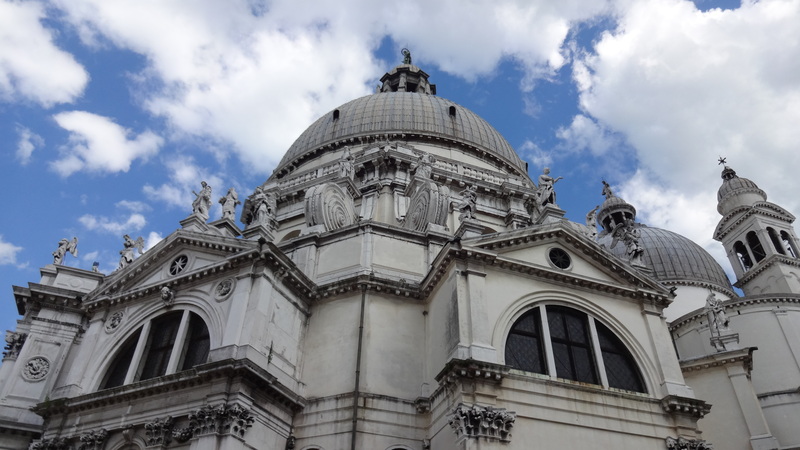 For my fourth An Ode to Venice post, I’ll be talking about one of Venice’s many landmarks, the Basilica di Santa Maria della Salute. 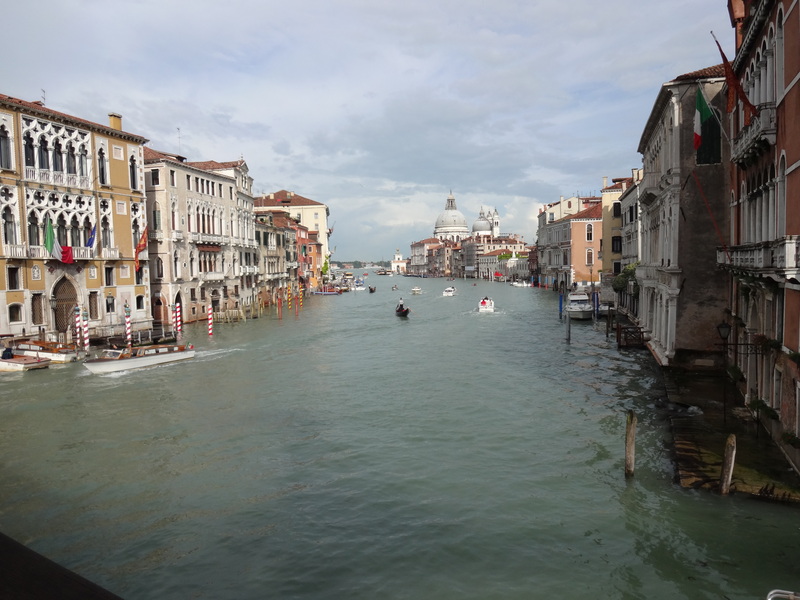 I mentioned the Salute in my post about the Grand Canal and the Accademia Bridge – it is the massive, domed church that sits at the entrance to the Grand Canal. For as large and imposing as its Baroque exterior is, though, inside it is surprisingly small and simple. 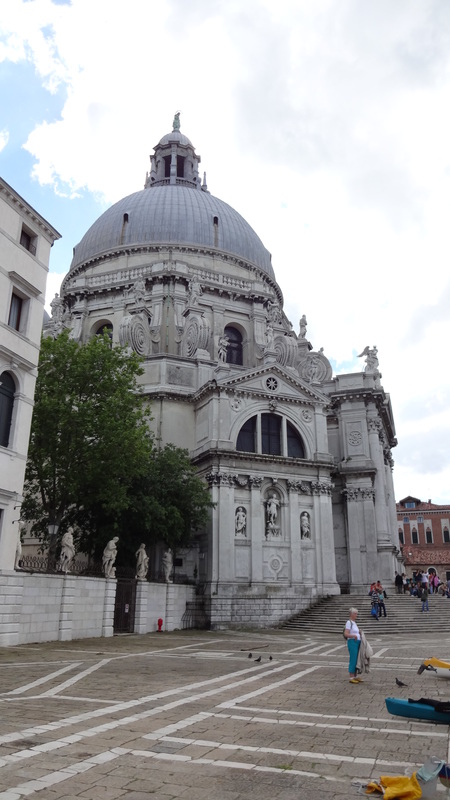 The church’s name translates to St. Mary of Health, and was built in thanksgiving for the majority of Venice’s population being spared from a bout of plague in the 1630s. 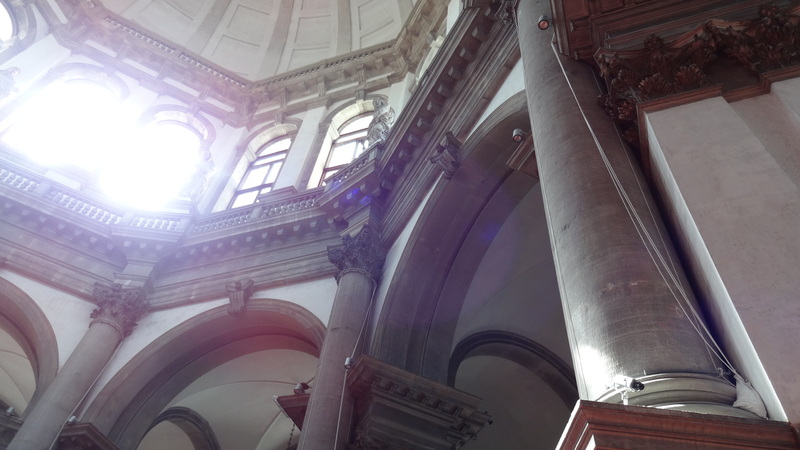 It was designed by the architect Baldassare Longhena, and was completed in 1687. 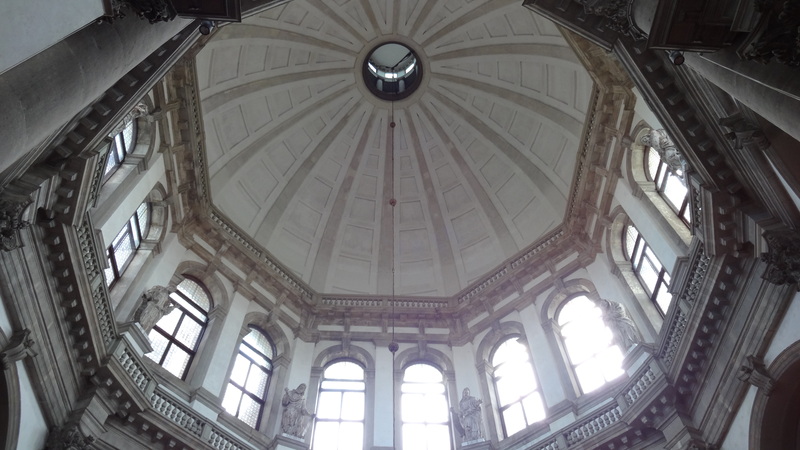 In The Violinist of Venice, Adriana comes here to pray and clear her head after something upsetting happens (I won’t give anything more away than that). It is a place of solace for her, as before her mother died she would bring Adriana to the basilica to pray. She is accompanied by Giuseppe, her servant and friend, and they have a conversation and brief argument. This same scene originally took place in Piazza San Marco, where Adriana and Giuseppe take a turn about the square, and but I had to change the location upon learning about Venice’s tides and acqua alta, and realizing that at that time of the day in December (which is when that scene takes place) Piazza San Marco would be completely flooded. So I moved the scene into Santa Maria della Salute, which I had visited while in Venice and thought was so beautiful that I had to work it into the book somewhere. It was also fitting that Adriana would want to pray and reflect at that point in the story, so it was the perfect location. 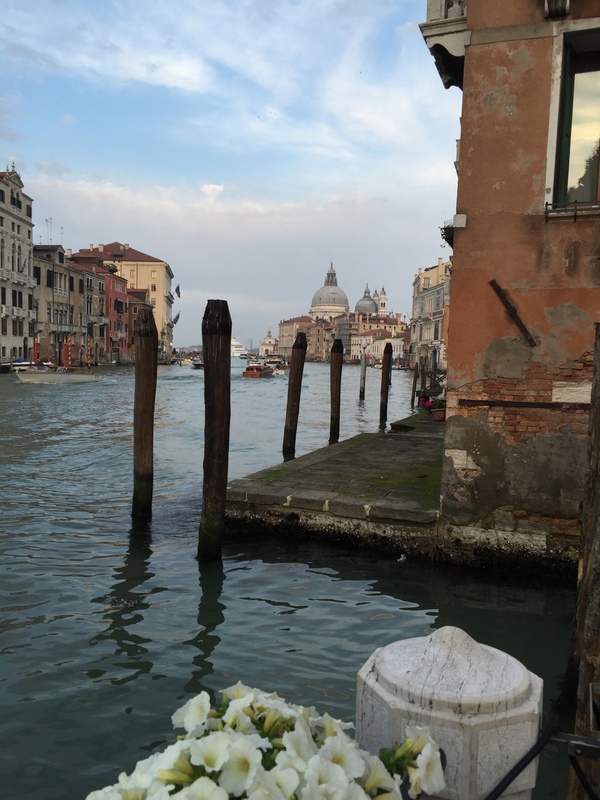 For my third An Ode to Venice post – which I know has been a long time coming! 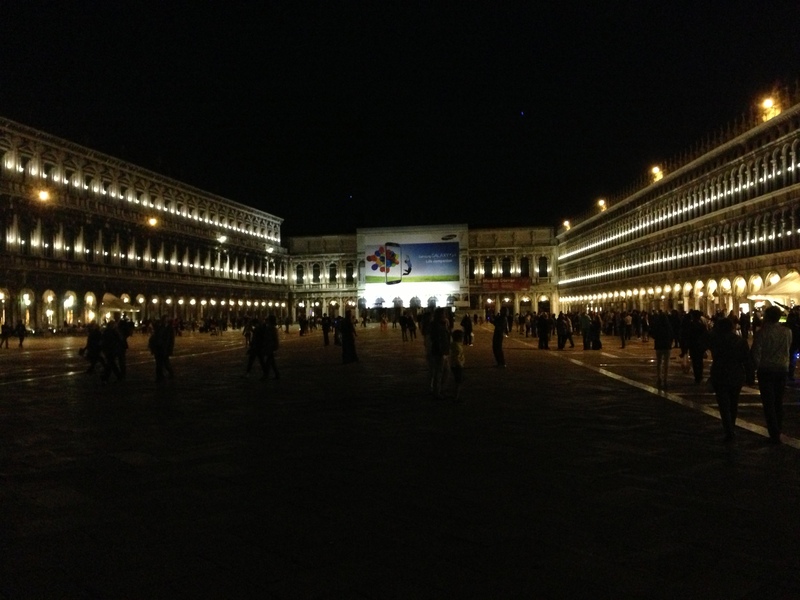 – I’ll be talking about what is arguably the center of Venice, Piazza San Marco, or St. Mark’s Square. One of Venice’s most recognizable and famous landmarks, Piazza San Marco was called at one time “the most elegant drawing room in Europe”. In many ways the center of public life in Venice, this largest public square in the city was where people congregated to meet one another, to do business, and for civic and religious holidays, among other things. 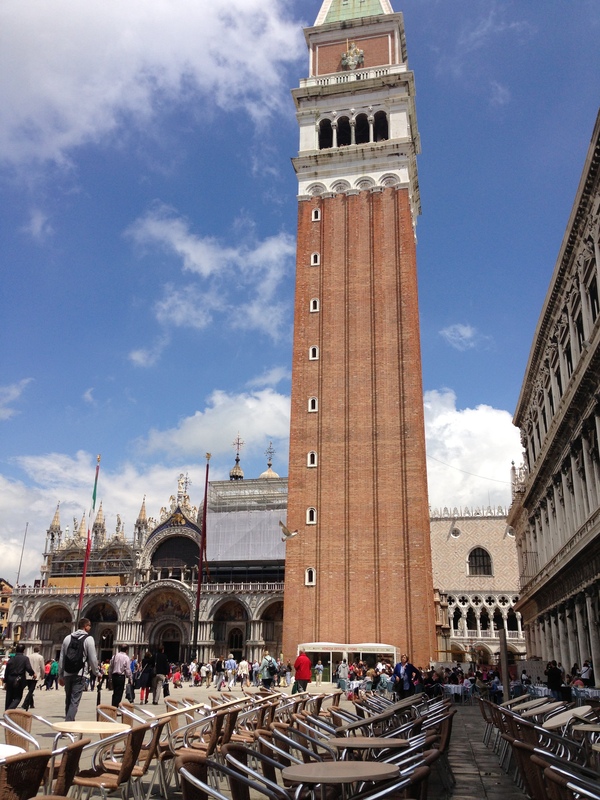 The picture above was taken from the balcony of the Basilica di San Marco, which dominates the square, along with its campanile or bell tower. Just to the right of the Basilica one can see a corner of the massive Doge’s Palace, the home of Venice’s elected duke as well as the seat of Venice’s government: the palace, which faces the lagoon, also houses the chambers where meetings of the Grand Council, the Senate, and the mysterious Council of Ten took place in Venice’s heyday as an oligarchic republic. 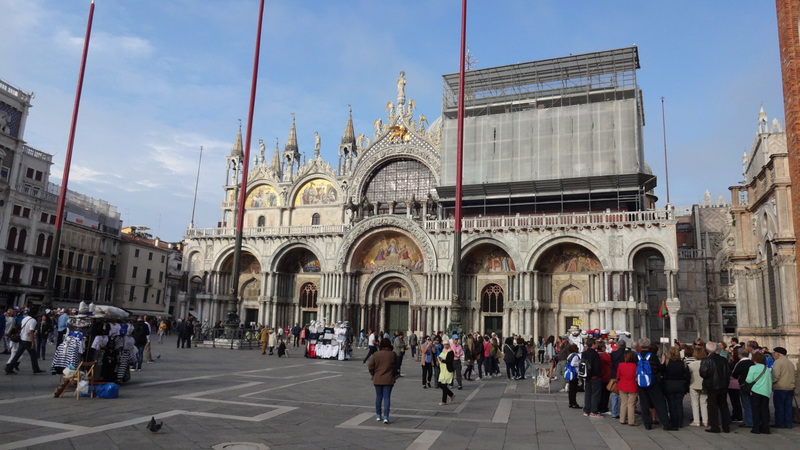 During the seasonal flooding – caused by tides – that Venetians call acqua alta (literally “high water”), the square can be under several feet of water – including the floor of the Basilica and other nearby buildings. 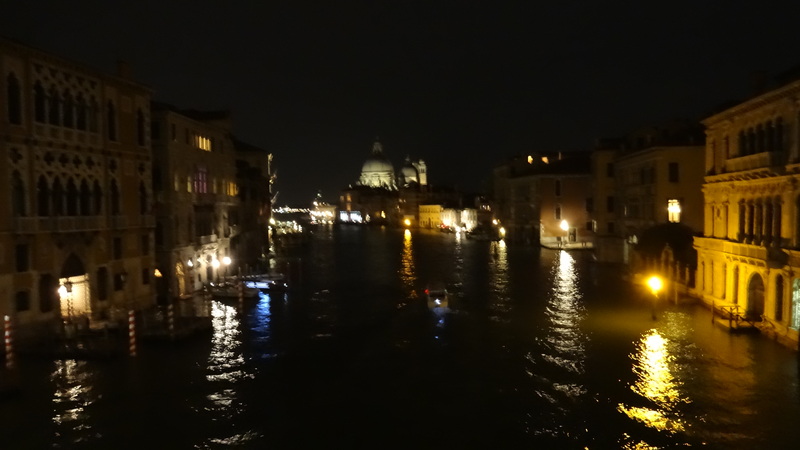 The acqua alta typically occurs most often in the winter, though it can happen at other times of the year as well based on the weather. The first time I went to Venice (in mid-May), there had been a big thunderstorm with heavy rain the day before, and the square had flooded. By the time I got there, there were still some big puddles, but nothing extreme. 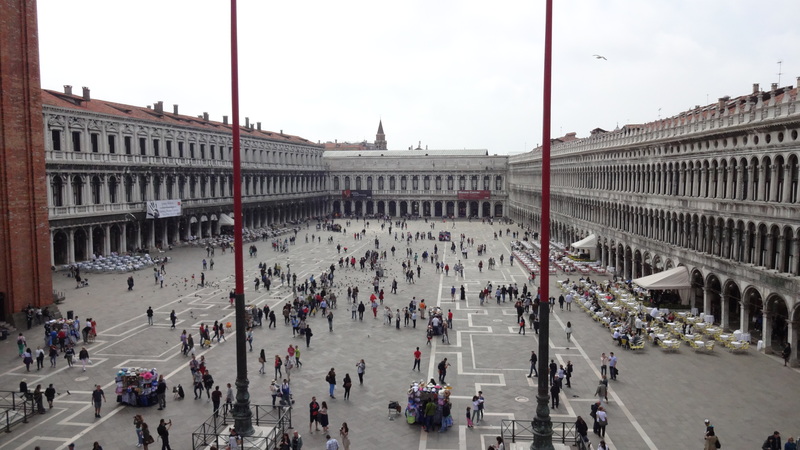 Today the Piazza San Marco is perhaps Venice’s most densely populated tourist site. Just as it was once where native Venetians would congregate, today it is something of “home base” for tourists, as it contains many of the city’s biggest attractions. There are vendors selling souvenirs every few feet, and cafes rings the piazza’s edges, including the famous Caffe Florian, one of the world’s oldest caffes. In its day it was a hangout for the likes of Giacomo Casanova, Lord Byron, and Charles Dickens. The coffee and food is ridiculously expensive, but it’s worth the experience, in my opinion. How this location figures into The Violinist of Venice: Piazza San Marco is where Adriana and Vivaldi go for Carnevale entertainments in chapter 25, and indeed the square was host to numerous festivities during Venice’s annual Carnevale, when the populace went about in masks for months at a time, parties happened in every house and on every corner, and all sorts of scandalous and debauched behavior occurred. Later in the novel Adriana returns there with her friends for Carnevale again, at a very different time in her life. Welcome to the third installment of my blog series that I’m calling Story & Song. Each post will feature two pieces of music: a modern/contemporary song from the playlist of The Violinist of Venice, and a piece of Vivaldi’s music that features in the novel. I’ll describe how both pieces fit into the story with a minimum of spoilers! It’s time for Story & Song: Part 3! Today I’m featuring a song I love by a lesser-known band called Crimson Chrysalis. I stumbled across South African symphonic rock band Crimson Chrysalis a few years ago, and I am sure glad I did. Their sound is truly something different and unique, and this song, from their first album Crimson Passion Cry, is, as you’ll hear, just lovely. This song goes with a scene in chapter 17 of The Violinist of Venice, when Adriana attends a party and meets the man who will become her suitor, Tommaso Foscari. This song, to me, fit perfectly with their first dance together because, despite the fact that Adriana has already embarked upon her affair with Antonio Vivaldi by this time, she still finds herself drawn to Tommaso: to his charm, his good looks, his kindness, his interest in her. She knows that she could love him, and her relationship with Tommaso is one that evolves and changes a great deal over the course of the novel. This concerto appears in the novel several times, but it first appears in chapter 15, which is a chapter that I am rather fond of. In this chapter, Vivaldi first gives Adriana this concerto to play, and the differences in her approach to the first movement versus the second causes him to teach her something very important about music. I actually started to learn the first movement of this concerto when I took violin lessons as research for the novel. I was not particularly good at it, but I jumped at the opportunity to attempt this when my teacher suggested it, since I had written the first draft of this scene/chapter not long before. This chapter also holds a special place in my heart, because it was the first portion of the novel I shared with anyone beyond one of my close friends, who is also my critique partner. I had been invited to read at the Fall Coffeehouse Open Mic event at my alma mater, Canisius College, which was being hosted by a friend of mine still in school there. I hadn’t thought of reading anything from Violinist until my critique partner asked me, “Why not?” And once the idea was out there, it was like a challenge, and I found I couldn’t back down from it. So, despite being rather nervous, I read this chapter aloud for the event, and it went over well! Welcome to the first installment of my new blog post that I’m calling Story & Song. Each post will feature two pieces of music: a modern/contemporary song from the playlist of The Violinist of Venice, and a piece of Vivaldi’s music that features in the novel. I’ll describe how both pieces fit into the story with a minimum of spoilers! As I’m sure I’ve said before, writing and music are inextricably linked for me. The Violinist of Venice is an obvious and literal example of this: the book deals mostly with music and its effect on a life, and includes musicians as its main characters. But even when I’m writing a story that doesn’t have any music at all (which doesn’t happen that often, to be honest) music is an integral part of my process. I have to listen to music when I write; it seems to unlock something in my brain. More than that, I am constantly building playlists for each novel that I work on, finding the perfect song for each scene and to describe what is happening in the lives of the characters. Sometimes listening to these songs gives me more insight into a situation or a character than I would have had otherwise. These playlists – while certainly fun to make – are helpful in another way too: I’ll load them onto my iPod and listen to the playlist of a work-in-progress while at work, or while exercising. This helps keep my head in the game, so to speak, and keeps my project on my mind and keeps me thinking and daydreaming about it when I can’t actually be working on it. So I’m hoping that this Story & Song series can help give some insight into my creative process and inspiration for The Violinist of Venice, as well as introducing you to some of the beautiful and powerful music written by Antonio Vivaldi that appears in the novel. This song was the lead single off of Italian heavy metal band Lacuna Coil’s 2009 album, Shallow Life. You can read a little more about this album and its impact on The Violinist of Venice in this previous post. 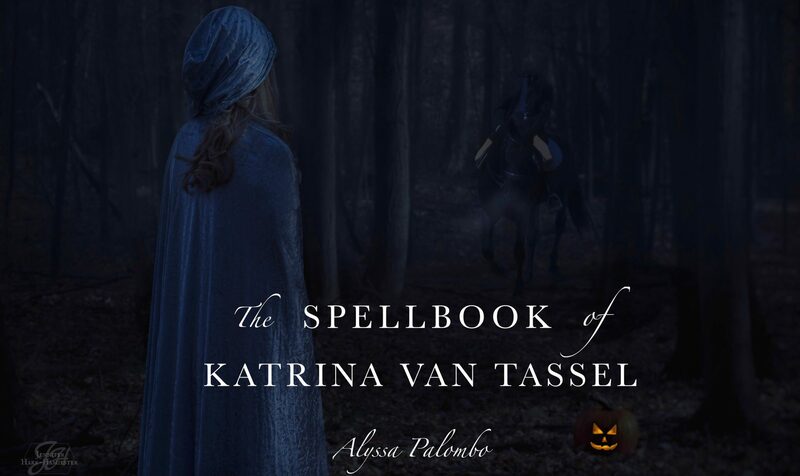 This album came out not long after I’d started writing the first draft of the novel, and “Spellbound” perfectly captured for me the attraction, interest, and tension that manifests between Adriana, my heroine, and Vivaldi in the first few chapters. The lyrics talk about – as you might expect – being spellbound, being unable to get someone out of your mind even when you’re not quite sure why. I tended to go for this song when writing/revising/reading through chapters four and five (chapter five is actually titled “Spellbound”, in a shout-out to this song). This is the most important piece of music – to me, anyway – that is described in the novel, specifically the first movement of the concerto. I first heard it not long after writing the first chapter of the book, and I fell absolutely in love with it right away. As such it made its way into the novel right away: this is what Vivaldi plays for Adriana (parts of it, anyway) at their first lesson in chapter two, when she asks to hear him play. He plays it again for her later on in the novel, and has a whole orchestra play it for her at an even later point. To me, this piece of music is so lively, so passionate; but the fact that it’s in B minor gives it something of a hungry, desperate edge. It was perfect for the novel as a whole, as well as simply being a beautiful and powerful piece of music, one that I can (and have) listen to countless times and never grow tired of. 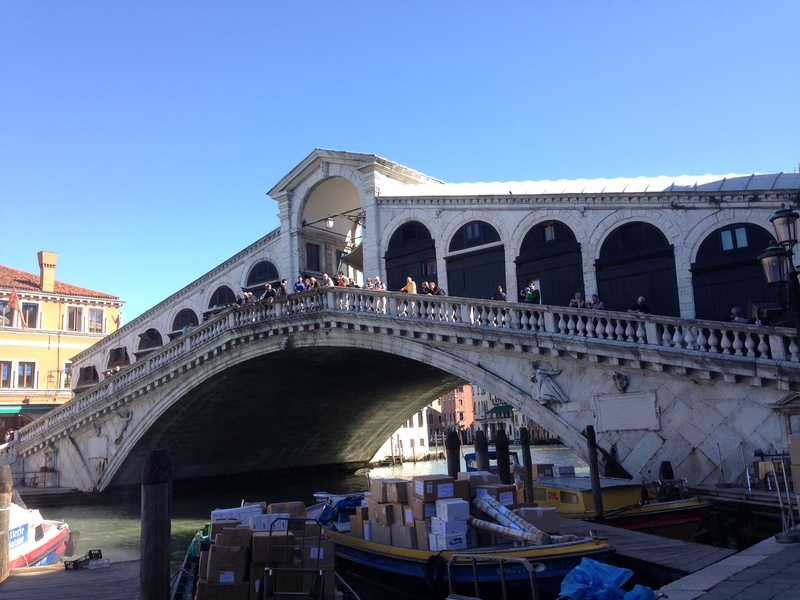 For my second An Ode to Venice post, I am highlighting one of the landmarks of the city, the Rialto bridge. Two rows of shops run up the center of the bridge, mostly souvenir and glass shops. The Rialto area is one of the oldest sections in Venice, and was the site of the original food market, which necessitated the building of the first bridge on the site, a wooden one built in 1255. As Venice grew as a mercantile power, the Rialto district became the center of commerce and trade in the city as well. The current stone bridge was designed by Antonio da Ponte and was completed in 1591. Like much of Venice’s magnificent – and old – architecture, maintenance and restoration is conducted on the Rialto bridge. On my visit there this past May, half of it was covered in scaffolding as such maintenance took place. It’s a bummer not to be able to fully see such a wonderful structure – and I was especially disappointed for my father, who had never been to Venice before and was seeing it that way for the first time – but of course, whatever has to be done to preserve such wonderful pieces of our history should be done where possible, in my opinion! 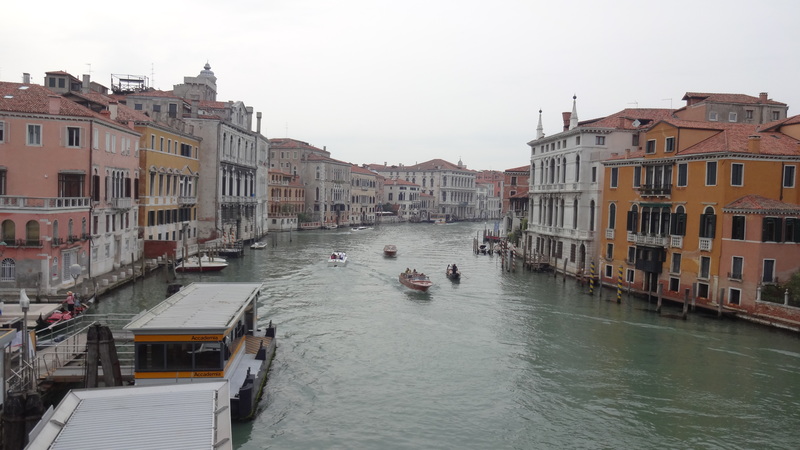 How this location figures into The Violinist of Venice: During the time that the novel takes place, the Rialto was the only bridge that crossed the Grand Canal, thus my characters would have been using it a lot. The bridge and the surrounding economic/market district are mentioned a few times throughout the book. And the first time I visited it, as I walked across it I was vividly aware of the fact that Antonio Vivaldi would have walked just where I was walking. It was a very cool feeling. 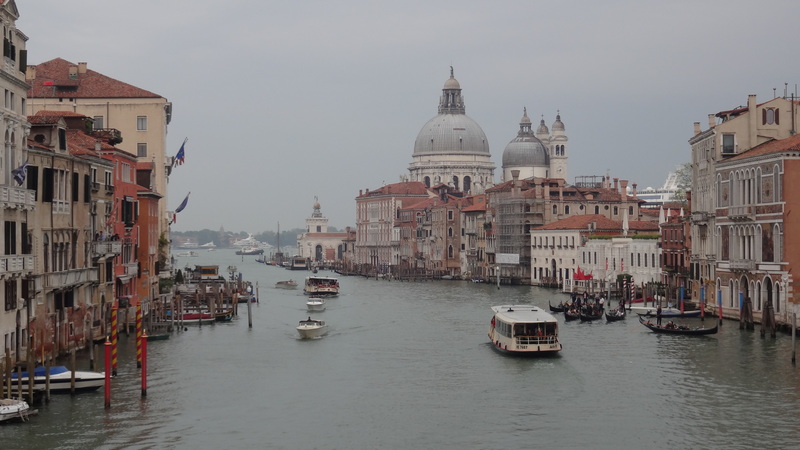 This post is the first in a new series I’ll be doing, called An Ode to Venice. In it, I’ll be posting pictures and information about my favorite places in Venice, including those that figure into The Violinist of Venice. 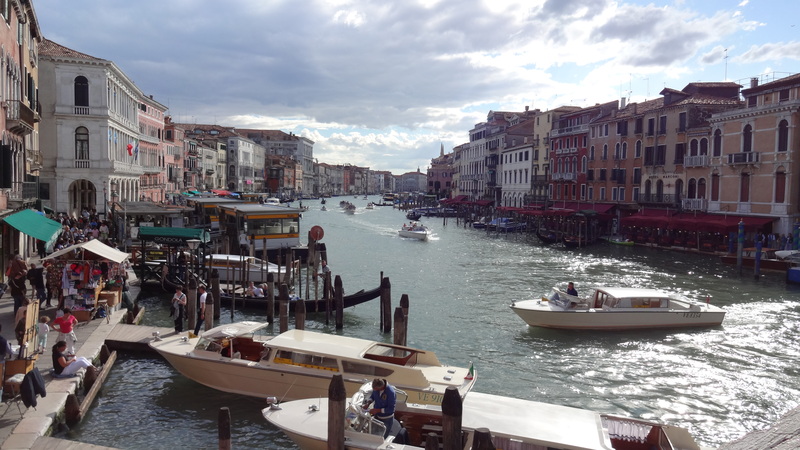 The subject of my first An Ode to Venice post is none other than my very favorite spot in the entire world: the view of the Grand Canal and lagoon from the Accademia bridge (or Ponte dell’Accademia). The first time I walked across the Accademia bridge – one of the four bridges which spans the Grand Canal – I fell in love at first sight. It was the most beautiful view I had ever seen, or have ever seen to this day. The pictures don’t really do it justice; if you’ve never been, someday you have to go and see it for yourself. Like most of the gorgeous views in Venice, I could just stand here and look at it all day. I have a canvas print of a picture of this view – taken by a professional photographer who was in my tour group the first time I went to Italy – that hangs over my writing desk. It’s like having a window into my favorite place on earth, and has definitely provided a lot of inspiration for me! The view from the other side of the bridge isn’t bad either! How this location figures into The Violinist of Venice: Well, it doesn’t 🙂 The first Accademia bridge wasn’t built until 1854, over 100 years after the events of The Violinist of Venice. The original structure was steel, and it was demolished and replaced by a wooden bridge in 1933. This second bridge was also eventually razed due to safety concerns, and the current bridge (also wooden) was built in 1985.